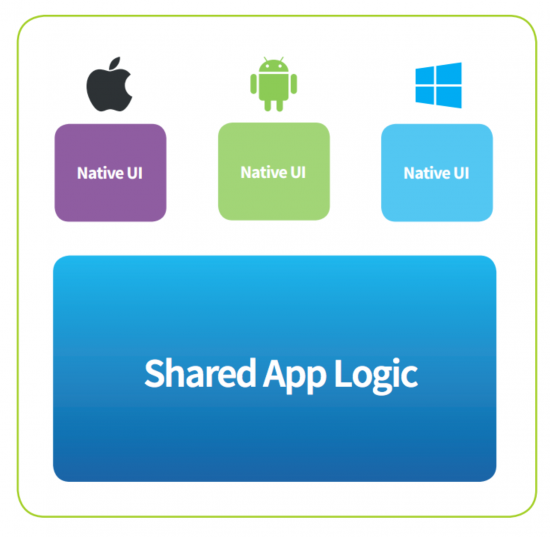 If you’re thinking about developing a mobile app, one of the first questions you’ll need to answer is, “Native or cross-platform?” This refers to how you’ll architect your software so that it runs on iOS, Android and Windows devices. Few professional apps are delivered on only one platform, but developing three separate native apps can be costly in terms of developer time. The alternative, cross-platform development, requires sophisticated development tools that deliver a native user experience from a single code base. The Xamarin software environment is currently one of the best solutions for cross-platform development. It provides a feature-rich API that allows a large amount of code to be shared across iOS, Android and Windows. Here at Seamgen we’ve found we get about 60–80% code re-use. Here are five compelling reasons to use Xamarin for cross-platform development. 1. Xamarin can build apps faster. By writing most of the code you need only once and sharing it on iOS, Android and Windows, you can decrease your app’s time to market. By cutting down on cross-platforms code duplication, you’ll have more time for adding functionality to your app. 2. Deliver a native platform experience. Xamarin is fully integrated with the SDK of each platform. This allows developers to use the common Xamarin API to access native controls that provide an authentic native experience. Xamarin compiles app code into native binaries instead of interpreting it on the fly, so you won’t have to worry about your app taking a performance hit. 3. Write shareable C# code. Instead of having to code platform-specific app solutions in Java, Objective-C or Swift, Xamarin allows developers to write C# code that runs on all three platforms. This modern, object-oriented programming language uses a simplified but powerful syntax that supports strong types, asynchronous programming, type inferencing and lambdas. 4. Develop code using a full-featured IDE. The Xamarin development environment includes Xamarin Studio, a fully-developed Interactive Development Environment (IDE) that increases developer productivity with features like code completion, a powerful debugger that works with either an emulator or hardwire devices, support for easy app publishing and an interactive UI builder. For developers who prefer the Visual Studio IDE, Xamarin provides a VS plug-in that adds many of these capabilities while allowing developers to leverage existing VS development skills. 5. Avoid bugs, increase software quality. Probably the greatest benefit for users of apps developed with Xamarin is an increase in software quality due to code re-use. It stands to reason that the chances of introducing platform-specific errors can be dramatically decreased when app code is written once and shared on different mobile platforms. The chances of introducing bugs are also reduced because developers work with one programming language and one API. When developers spend less time fixing bugs, they have more time for adding functionality and polishing the user experience. This is a sampling of the benefits that Xamarin provides for app developers, but the real winners are app customers who can enjoy using full feature apps that provide great native user experiences on all the major mobile platforms. Interested to learn more about Xamarin? Our Getting Started with Xamarin might be of interest to you too. You can also check out case studies of our work on a Theme Park app, and an Education app.